During the four week school holiday break, I flew to Japan with my dear friend Ele. 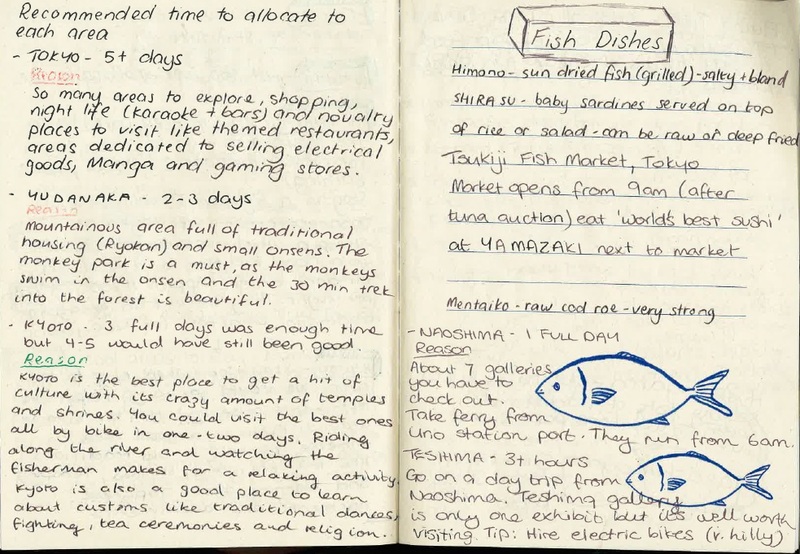 We’d only booked an Airbnb for the first three nights in Tokyo; our remaining 18 days were blank pages eagerly waiting to be filled. I’m going to fast forward you past our initial ordeal with a series of dot points. · Ele missed her connecting flight from Cairns to Tokyo due to poor flight scheduling with Tiger Airways (Rookie error). I board our Jetstar flight while Ele was still waiting for her bags in the domestic terminal. 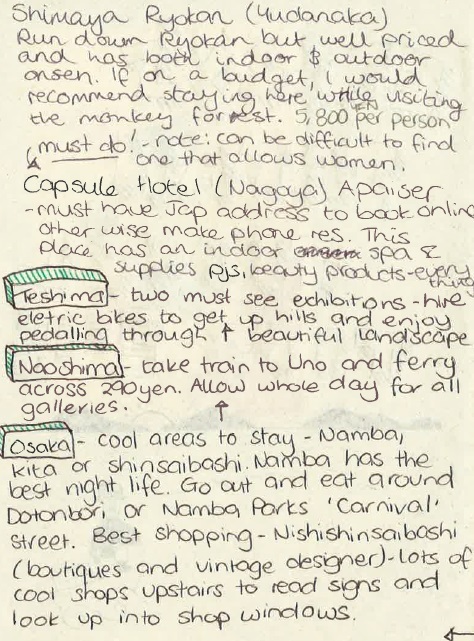 · Ele spent a night in Cairns while I fumbled my way through Narita Airport and arrived at our Airbnb in Shibuya three and a half hours later (only meant to take around an hour and twenty). · Ele flew to Tokyo complaining of a sore leg upon arrival. Gained little to no sympathy. · Three days passed, Ele went to hospital and ended up having surgery to remove a paralysis tick; obtained in the lush grasses of Tropical North Queensland. · Ele was bed bound in our Ryokan for two days before she had to go back to hospital due to the development of a secondary infection caused by particles of the tick still inside her wound. · One week into our holiday, Ele was hobbling around the streets like an old lady but her spirits had lifted. So despite all the drama, we had an absolute blast. Every day our cheeks were hurting so much from laughing at all the unfathomable cultural differences; relating to human behaviour, leisure activities and the adornment of everything from buildings to food. If you’ve never visited Japan, I’d recommend it above anywhere else I’ve travelled so far. 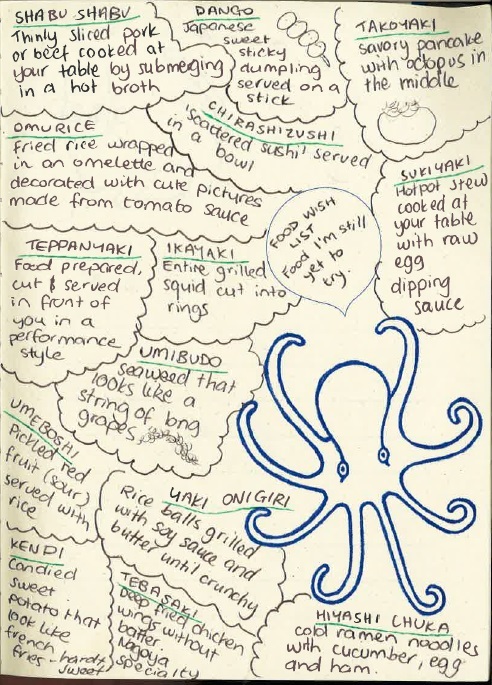 What I thought I knew about Japanese culture was shredded to pieces each day as I moved around the country. Based on news and technology advancements stemming from Japan, I thought that everything would be high-tech and sophisticated; including the people in major cities. While this was true in some cases (the bullet train, public announcements/advertising splayed throughout the city) I was gobsmacked by how ‘old school’ most of their systems and daily operations were. It’s difficult to explain how my assumptions were so very wrong without going into specific detail, so instead I’ll try to sum up my overall impression of the people in a few sentences. Japan is the epitome of bamboozlement to any foreigner. The people are so truly ‘Japanese’ that an outsider will never really know what it’s like to have such ingrained ideas about cultural identity, pride and self-sacrifice of voice for the greater good of those they live amongst. The people supress their true emotions and opinions in exchange for humility and extreme order. They pride themselves on their stringent organisation relating to time and tasks and take diligence to a level far beyond what’s expected in Australia. The people are pain-stakingly polite and helpful to the point that I feel ashamed when I think about how we Australian’s treat one another. Japanese people would be mortified if they witnessed the verbal cruelty among strangers relating to trivial things like car park spaces and issues with products and services. Despite all the above mentioned positives, there are some things about Japan that don’t sit well with me. It seems like the Japanese education system does a lot of ‘brain-washing’ to ensure their people remain ‘authentically Japanese’. For example, apparently the curriculum only requires students to learn historical and geographical facts about different countries. Upon speaking to a handful of English speaking Japanese people in their mid-twenties, they expressed great fear in travelling to countries like Australia because they’d been taught from a young age that there were many dangerous animals there. I’d hate to think that the education system is stifling young peoples’ opportunities to experience life outside of Japan. However, based on what I’ve been told so far, it seems like a sad truth. Even worse, I was told that in some cases if a Japanese person chooses to migrate overseas and learn about another culture or language, upon returning they risk being considered a ‘sell-out’ or ‘traitor’ by their peers or family who have no interest in leaving their birth country. I found it bizarre that in Japan, living overseas and being able to speak another language can result in social and work place discrimination. It’s polar opposite to Australia, where speaking a second language or being knowledgeable about other cultures is considered desirable and honourable throughout the nation. I think Australians can learn as much from the Japanese as they could learn from us if given the opportunity. 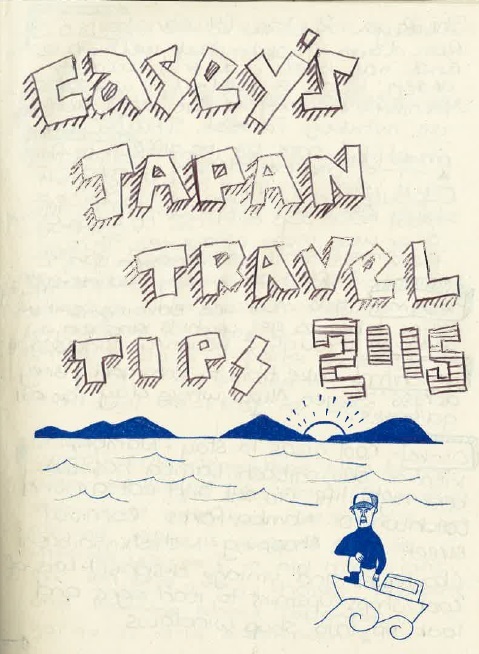 I urge each and every one of you to make visiting Japan a priority when considering your next travel destination. It’s extremely safe and kid friendly and the hospitality of the people (nationwide) is worth the visit alone. 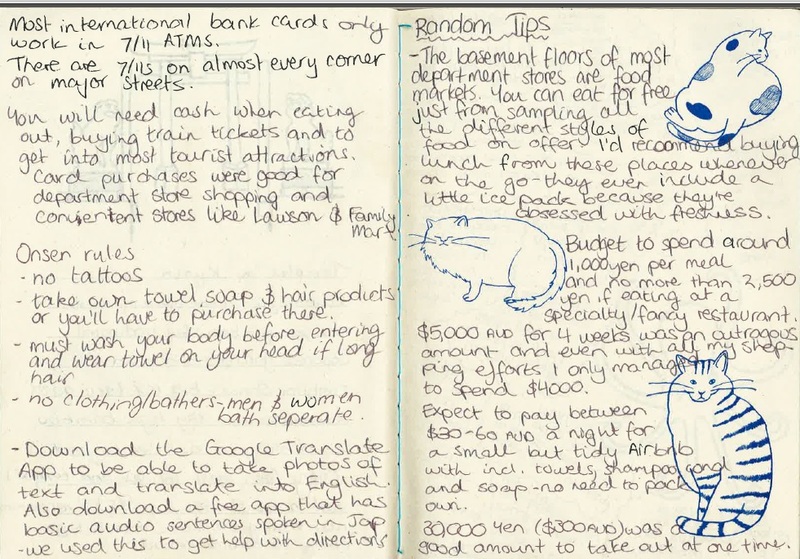 During my trip I carried a notebook to record the addresses of places I’d visited along with anything I’d learnt that I wanted to remember or share. 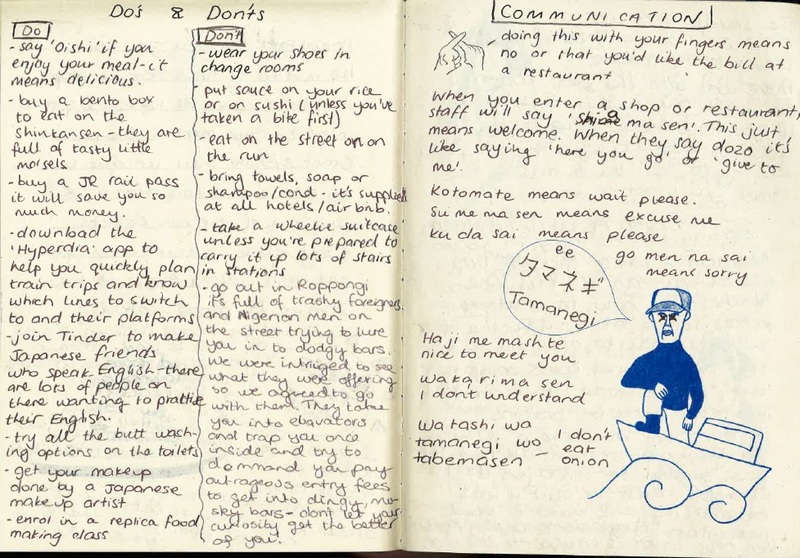 I turned my notes into a PDF for my brother who is heading over there in a few weeks. 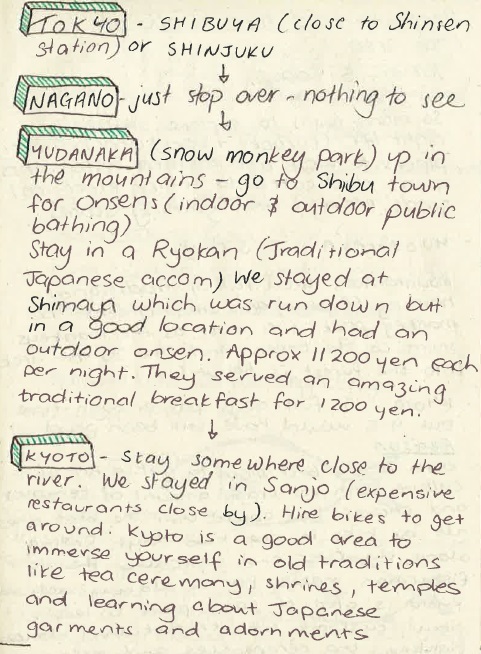 Here are some pages which you may find useful if you’ve been inspired to check out Japan for yourself. I’ll be posting some photos from my trip shortly. If you’d like to receive each new post via email, please sign up by putting your email address in the box to the right hand side.